I had the pleasure of attending MerleFest last month. If you are not familiar with this Wilkesboro, NC festival, think Woodstock for Bluegrass, Folk, and "Traditional-Plus" music, only cleaner and well-organized with a run of 23 successful years. 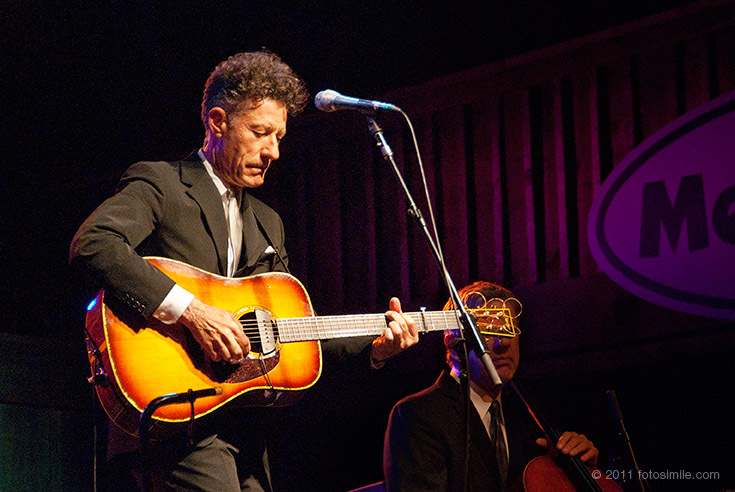 The Saturday night headliner was Lyle Lovett performing his unique music in all its drollness. During the performance I went down as far as I could, stood around for a bit and the next thing I knew, I was part of a group of photographers and wannabes being led down to the front of the stage to grab our shots of his chiseled visage up close and personal. I'm not very experienced at concert photography but I'm pleased with what I got. Great shot! I think his publicist should use this. I love the color palette. I'm sure it was a great festival. Awesome shot, very clean and crisp especially for 1250 ISO.